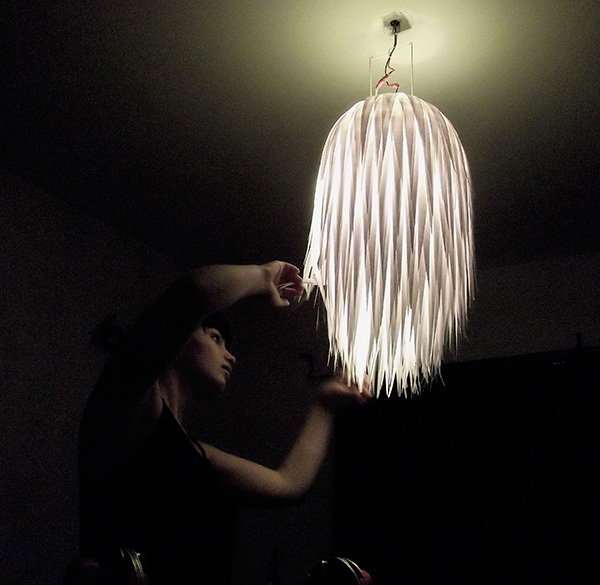 Oona made this pendant lamp for my bedroom. It is all the right good things – cheap, beautiful, and easy to do. Oona created the lamp in a marathon of TV watching of Law & Order or Hell’s Kitchen late into the night. It is a dramatic light fixture for very little money. I saw a tutorial on Design Sponge – click here for her post with more how-to photos. – a cool to the touch LED lightbulb. I bought a dimmable one. This light fixture cost under $20 to make. This entry was posted in our revamping and home design and tagged decorative paper lantern, ikea paper lantern, paper lantern, paper lantern embellishment, paper pendant lamp by ileana. Bookmark the permalink. So elegant! And the photos do it justice.